J35, a member of the critically endangered southern resident family of orcas, gave birth to her calf only to watch it die within a half-hour. 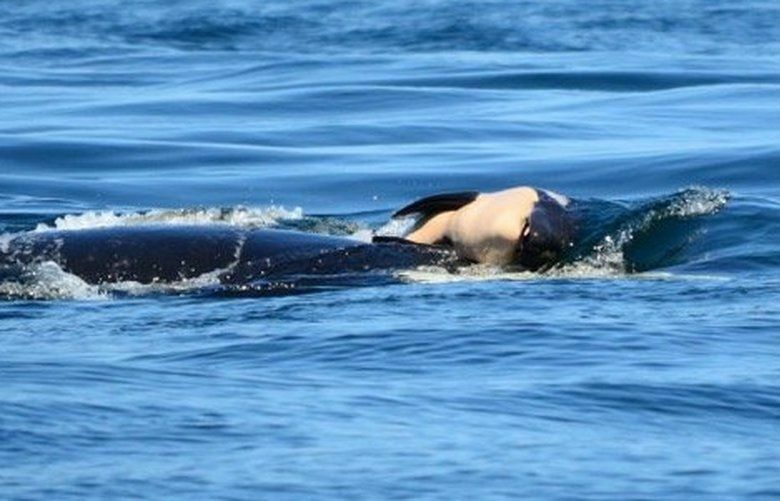 A grieving mother orca was seen still carrying her dead calf Thursday evening, laboring to push it through a 4-knot current, and making deep dives to retrieve it each time it slipped off her head and sank. “It is just absolutely gut-wrenching to watch,” said Taylor Shedd, program coordinator of Soundwatch, who has followed the whale nearly continuously in daylight hours, keeping state and federal agencies updated and urging boaters to keep their distance. 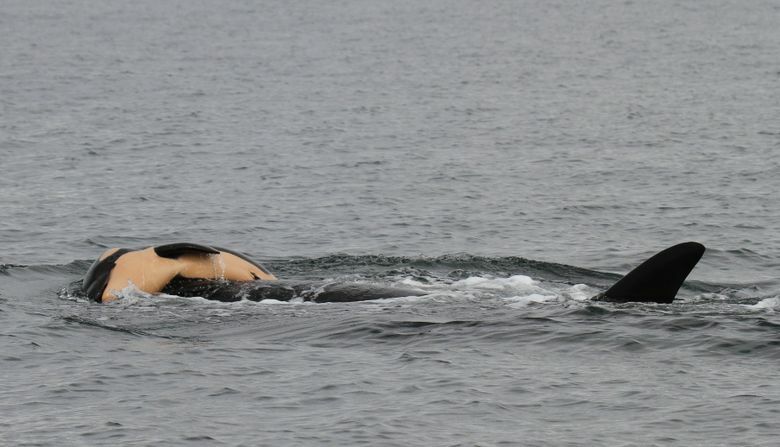 Born Tuesday morning, J35’s calf lived for about a half-hour. She has been refusing to let her calf go, swimming with the calf balanced on her head. It’s an expression of grief biologists have documented in whales and dolphins all over the world. At times the mother’s breathing has been very labored. The Soundwatch boater-education program, run by the Whale Museum at Friday Harbor, puts educators on the water every day during whale-watch season to approach boaters as needed to remind them of the 200-meter distance required between boaters and marine mammals to minimize disturbance. During J35’s grief, Soundwatch has been keeping vigil with the whale, explaining to curious boaters what is happening, and why they need to keep their distance. Commercial whale-watch tours have been voluntarily staying clear to give the whale and her family privacy. “We are spreading out the fleet, keeping away, it is just so very sad,” said Jeff Friedman, president of the U.S. side of the Pacific Whale Watch Association. San Juan Island resident Lodie Budwill, of the Center for Whale Research, reported that on Tuesday evening, before sunset around 8:30 p.m., she noticed that a group of female orcas had gathered in a tight circle with J35 at the mouth of Eagle Cove on the west side of San Juan Island. “It was beautiful to observe, yet very sad knowing what had taken place earlier in the day,” she wrote in an email to The Seattle Times. She said the whales remained encircled with J35 in the same site for at least two hours. Shedd said the mother was pushing the calf at 7:08 p.m. Thursday when he had to leave her for the night.